What Is a TOSLINK Audio Connection? Early on, audio connections for equipment were fairly simple and straightforward. One merely matched up the appropriate speaker wire and/or RCA input and output cables, and that's it! But as technology and hardware matured, new types of connections were developed and implemented into the latest and greatest products. If you take a look on the back of any modern receiver/amplifier, you're bound to see an array of analog and digital connection types alike. One of the latter is likely to be labeled as digital optical, or formerly known as TOSLINK. The TOSLINK connection system (port and cable) was originally developed by Toshiba, and it is more commonly known as an optical, digital optical, or a fiber-optic audio connection. Electric audio signals are converted to light (quite often red, with wavelengths upward of 680 nm or so) and transmitted through a fiber made of plastic, glass, or silica. TOSLINK is one of several methods for transmitting a digital audio signal between components in a wide variety of consumer audio equipment. The use of a TOSLINK cable for sending digital audio input/output streams between components is an alternative to an HDMI or a coaxial connection (less common). 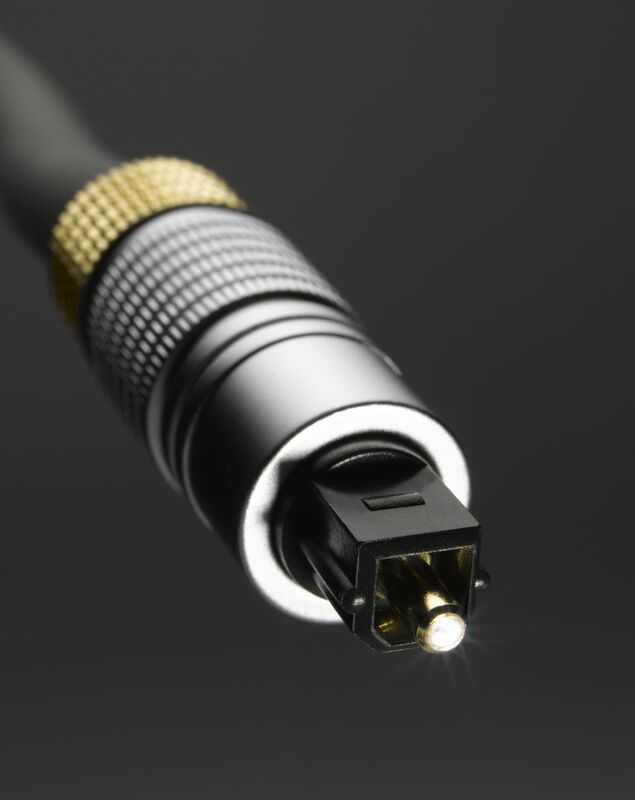 If you take a look at the business (fiber optic) end of a connected TOSLINK cable, you'll notice a red dot beaming right back at you. The cable end itself is flat on one side and rounded on the other, so there's only one orientation for plugging it in. Many wireless audio adapters, HDTVs, home theater equipment, DVD/CD players, receivers, amplifiers, stereo speakers, computer sound cards, and even video game consoles can feature this type of digital optical connection. Sometimes it can be found paired alongside video-only connection types, such as DVI or S-video. TOSLINK cables are designed to be capable of handling lossless stereo audio and multi-channel surround-sound, such as DTS 5.1 or Dolby Digital. The benefits of using this kind of digital connection are an immunity to electromagnetic noise interference and a great resistance to the loss of signal over the distance of the cable (most notably with higher-quality cables). However, TOSLINK isn't without a few drawbacks of its own. Unlike HDMI, this optical connection is unable to support the bandwidth required for high-definition, lossless audio (e.g. DTS-HD, Dolby TrueHD) – at least without compressing the data first. Also unlike HDMI, which proves its versatility by carrying video information in addition to the audio, TOSLINK is audio only. The effective range (i.e. total length) of TOSLINK cables is limited by the material type. Cables with optic fibers made of plastic are often found no longer than 5 m (16 ft), with a maximum of 10 m (33 ft). One would need a signal booster or repeater with additional cables to span greater distances. Glass and silica cables can be manufactured to longer lengths, thanks to the improved performance (less data loss) of transmitting audio signals. However, glass and silica cables tend to be less common and far more expensive than their plastic counterparts. And all optic cables are considered fragile, being that any portion can be damaged if bent/coiled too sharply.